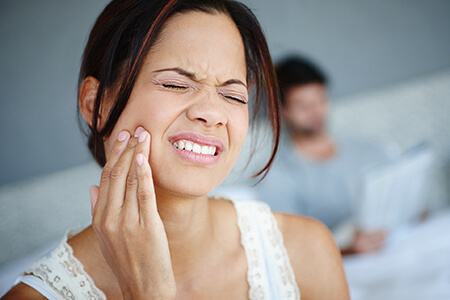 Dental emergencies tend to be sudden, frightening, and very inconvenient. Maybe your child has cracked a tooth while having fun on the playground, or maybe a severe pain has cropped up in a back tooth after chewing on something particularly hard. Whatever your family’s situation is, you can trust the team at Pasadena Family Dentistry to provide compassionate, effective relief. Please don’t hesitate to contact us here in Pasadena, TX today if you’re in need of an emergency appointment. Dr. Holmes, Dr. Revel, and Dr. Lowry see urgent cases as soon as possible, and often on the very same day as your call. If you or a family member has knocked out a permanent (“adult”) tooth, time is truly of the essence when it comes to determining whether or not reattachment is possible. If you still have the tooth, gently rinse any foreign debris from the surface (while leaving all connected natural tissue untouched and intact) and then place it back into its original spot within the mouth, holding it there. If this can’t be done, put the tooth in a container of milk and bring it with you to our practice right away. Rinse your mouth with warm water in order to clean the injured area. Facial swelling is likely to occur after an injury like this; cold compresses against the face can help reduce the effect as you make your way to our office. The pain may be being caused by something stuck between the teeth. Floss and rinse thoroughly in order to dislodge any foreign debris; if the discomfort persists, please reach out to our team. You may take painkillers in the interim, but do NOT place them directly on the tooth or gum tissue, as it may cause a burning sensation.